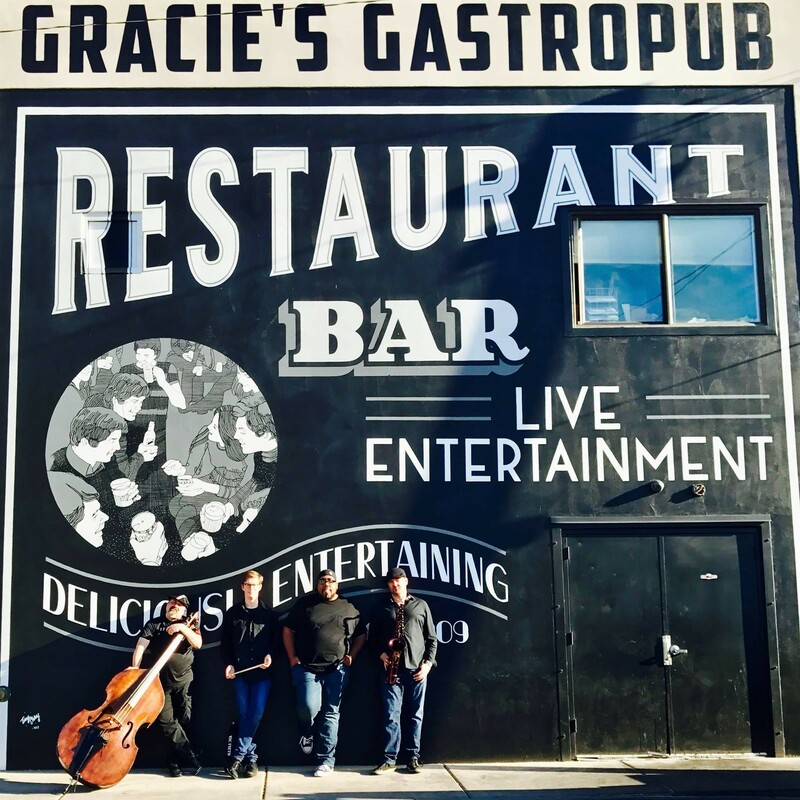 If you like intimate jazz played with loose spontaneity, there isn’t a better format in town than the Gracie’s Monday Jazz Jam, hosted by local David Halliday and the Jazz Vespers Quartet. On Monday, July 30 at 7 p.m., these weekly jam sessions will celebrate four years in existence with Jam #204. Each week, local jazz standouts trade licks with each other at Gracie’s. Many weeks have also featured world-class musicians either soaking up or taking part in the jam sessions: Jim Belushi, Delfeayo Marsalis and members of his Uptown Jazz Orchestra, 2017 International Sarah Vaughan Vocal Jazz Competition winner Quiana Lynell, Chair of the Brass Department at Berklee College of Music Sean Jones, Grammy-winning tenor saxophonist David Sanchez, celebrated pianists Justin Kauflin, Akiko Tsuruga and Art Hirahara, and Grammy-nominated blues man Kenny Neal, among many others. “Since the beginning in 2014, I’ve tried to foster a warm and inviting environment at the jam so players of all levels feel comfortable and no one feels unwelcome,” Halliday says. The format emphasizes democracy: Each Monday night, Halliday and the Jazz Vespers Quartet perform from 7-8 p.m., then serve as house band from 8:30-10. With no cover and food and drink available, it’s the perfect setting for cozy, 21+ fun with a side of cosmopolitan artistry. Made up of Halliday on sax, Isaiah Smith on piano, Denson Angulo on bass and Parker Swenson on drums, the Jazz Vespers Quartet traces its history to a Salt Lake City tradition: Jazz Vespers at the First Unitarian Church, a 30-year tradition falling on the last eight Sundays before Christmas each year. The JVQ performed musical tributes to everyone from The Beatles to Led Zeppelin to Aretha Franklin, Frank Sinatra, Ella Fitzgerald, Miles Davis, Stevie Wonder and many more. Halliday cites Gracie’s co-owner Shawn Frehner and Deno Dakis as catalysts for the Monday Jazz Jam’s success and points to the excitement around the July 30 edition, when JVQ will pay tribute to soul titan Bill Withers, Frehner’s favorite artist. “After the Withers tribute, Jam #204 will commence featuring Salt Lake City’s finest local talent as always,” Halliday finishes. We hope to see you there tonight. For more info, visit facebook.com/graciesmondayjazzjam, facebook.com/jazzvespersquartet or davidhallidaymusic.com. Looking back a day and on to a much bigger stage, the second annual LoveLoud Festival powered by AT&T sold out Rice-Eccles Stadium on Saturday, July 28, raising $1,000,000 for national LGBTQ+ charities like Encircle, Trevor Project, Tegan and Sara Foundation and more. Although the Church of Jesus Christ of Latter-day Saints didn’t officially bless this year’s concert, institutional support did come from the state of Utah, with Lt. Governor Spencer Cox on hand to read an official proclamation from Governor Gary Herbert declaring July 28, 2018 as LoveLoud day in Utah. Scores of standout performances followed throughout the afternoon and evening from Zedd, Linkin Park's Mike Shinoda, Grace Vanderwaal, Neon Trees' Tyler Glenn and A.W., stand-up comedian Cameron Esposito, singer and dancer Julianne Hough, actor and singer Jussie Smollett, Ellen Show star Kalen Allen, Tegan Quin of Tegan and Sara, Grammy-nominated songwriter Justin Tranter, musician WRABEL, singer Mary Lambert, Olympic silver medalist Gus Kenworthy, actress and dancer Heather Morris, comic Dana Goldberg and singer-songwriters VINCINT and Parson James. Bookending that array of entertainment was an introduction from Apple CEO Tim Cook and a headlining set from Imagine Dragons and its passionate frontman Dan Reynolds, who created LoveLoud to further his mission of combating high suicide and depression rates among LGBTQ+ youth.